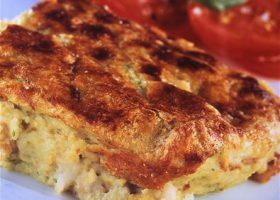 This is a great family meal dish – it is quick and easy to make and unlike other soufflé recipes it will not sink as soon as it is removed from the oven. This is best made using a food processor but could be made by hand- if you grate the cheese and bread to make crumbs. Place bread and cheese into food processor and process for 2-3 minutes until it resembles breadcrumbs. Add rest of the ingredients except Parmesan and process till evenly mixed. Pour into a lightly greased ovenproof dish and place in oven for 30-35 minutes until the top is golden and firm to the touch. Serve with a tomato and basil salad and warm garlic bread.